The Lagos State Government on Friday said that from July 1, 2016, it would commence a total enforcement against street trading and street hawkers, saying that the law banning their activities across the metropolis would take its full course. Speaking at a live interview session on Television Continental, the State Governor, Mr. Akinwunmi Ambode said that the renewed enforcement is in line with Section One of the Lagos State Street Trading and Illegal Market Prohibition Law 2003 which restricts street trading and hawking in the metropolis. The Governor, while sympathising with the family of a street hawker who was knocked down by an articulated truck while trying to evade arrest from officials of Kick Against Indiscipline along Maryland Bus stop on Wednesday, regretted that the situation led to the destruction of public assets. “It is not in our DNA to allow someone to just die by road accident or the way it happened in respect of the incident. But beyond the fact that we lost one person while crossing the road as a result of evading arrest by KAI officials, I need to tell Lagosians that over 49 buses were actually destroyed and it is costing us like almost N139m to put those buses back on the road,” he said. 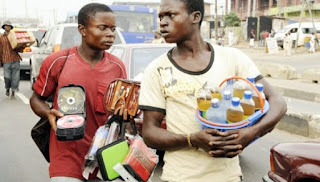 Consequently, Governor Ambode said the State Executive Council has resolved to enforce the Law, which according to him makes both the hawker and the buyer liable of the offence. “The issue is we need to enforce our laws because we already have a law in respect of that and then there is a clause in it which says the buyer and the seller are both liable and that we are going to fine them either N90, 000 or a six month jail term. “What we are doing on traffic is that we are introducing new strategies to eliminate traffic, but Lagos being a cosmopolitan city, you cannot totally eliminate it but now this is the case, in the next few days, you will see on the street of Lagos signs that will be warning you that buyers and hawkers should be aware that there are consequences,” Governor Ambode said.